Home » Chlorofresh Liquid Mint Flavor - 16 oz. Chlorofresh Liquid Mint Flavor - 16 oz. 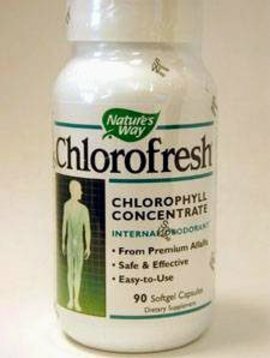 Chlorofresh liquid contains a special chlorophyll complex derived from premium alfalfa leaves. It is chlorophyll that initiates the process of photosynthesis-one of the most important chemical reactions on earth. Chlorophyllin copper complex 50 mg. Suggested Use: Adults and children 12 years of age and over: Take two tablespoons one to two times daily. If odor is not controlled an additional two tablespoons may be taken, but do not exceed six tablespoons per day. The smallest effective dosage should be used. Children under 12 years of age: Consult a doctor before use. Directions for use as a mouthwash, rinse, or gargle: Use full strength or add one to two tablespoons of Chlorofresh liquid to one half glass of water. Rinse mouth thoroughly and repeat.